The first component of Europe’s space data highway passed several critical tests this summer replicating the harsh launch and space conditions it will soon have to endure. The European Data Relay System, or EDRS, will consist of two geostationary nodes collecting data from low-orbiting satellites via laser and radio links for retransmission down to Earth. Complementing current downlink capabilities, it will ensure the near-realtime availability of information for time-critical events such as environmental monitoring, emergency response and security missions. In addition to the sophistication of the technology, the payloads must also be robust enough to withstand the rigours of launch and life in space. This first element, EDRS-A, consists of three hosted packages on the Eutelsat-9B satellite for launch next year. The first is a laser terminal capable of receiving user data at speeds of up to 1.8 Gbit/s from a satellite 45,000 km away. EDRS-A also carries Ka-band inter-satellite link terminal that will handle up to 300 Mbit/s – a vast improvement over today’s systems. 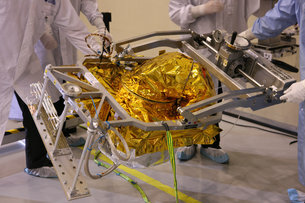 The third package is an opportunity payload funded by Italy’s ASI space agency operating independently of EDRS to provide broadcasting services over Italy. 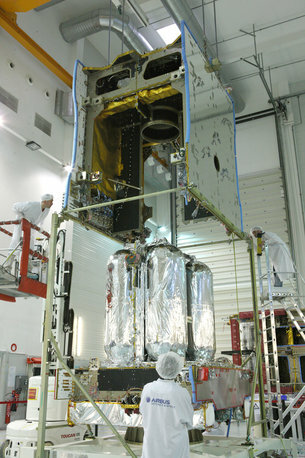 The testing took place at the Toulouse, France facilities of Airbus Defence and Space, the Eutelsat-9B prime contractor. After its two main modules were mated, the satellite and its hosted payloads passed the month-long thermal vacuum test in July. The vibration test then subjected them to the rigours of launch, followed by a stint in the acoustic test chamber. They emerged unscathed from them all. Germany’s TESAT Spacecom is the prime contractor for the EDRS payloads and also provided the laser terminals on the four low-orbiting Sentinel-1 and -2 Earth observation satellites. Part of Europe’s Copernicus programme, these satellites will reduce the time delays in transferring their data to the ground through the greater flexibility of this new service. The satellite and EDRS payloads now face their final radio-frequency tests. Then the solar wings and antennas will be added ready for launch preparations to begin. The EDRS SpaceDataHighway is a commercially operated data relay system created as a public–private partnership between ESA and Airbus Defense and Space. As prime contractor, the company will build, operate and co-fund the infrastructure, as well as providing the data transmission services to ESA and customers worldwide. ESA is carrying out the project on behalf of its Member States as part of ARTES, the Advanced Research in Telecommunications Systems programme.